Once upon a time, I used to come straight home from work + begin cleaning. I would change my clothes, get out the vacuum, the dust rags, and the wood polish, and I'd hop to it. That was before I had kids, so looking back, I am honestly wondering what in the world I felt the need TO clean for?! I mean seriously, it was kind of an obsession?! So fast forward to my current life: wife of eight years, mom to a three and four year old, and owner of FIVE household pets. Since we aren't having any more babies, this past summer I was itching for a baby of SOME SORT. Someone PLEASE tell me why I thought it was a really intelligent idea to get an orange kitten from a local pet shop, because during this past summer, my kids battled constant illness and I swear I was doing nothing BUT cleaning. (Maybe that was my reminder that I'd been slacking?! Lord help me, it was seriously awful.) Anyway! On top of the above roles + duties I serve, I am a full time special education teacher, professional photographer, and blogger (obviously)-- WHO in the freekin' heck has time to constantly clean her floors as much as I NEED to?! Well, hold on a second. 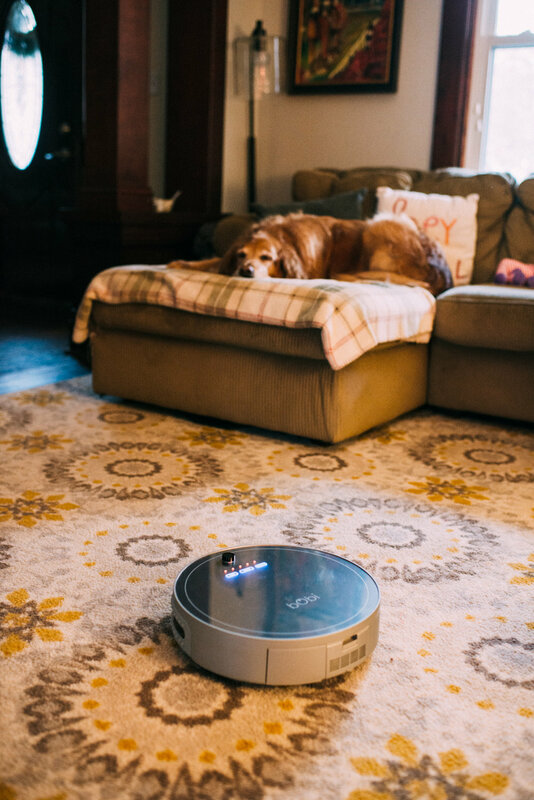 My girl Chelcey texted me a couple of months ago and asked if I had ever heard about the bObi vacuum; a robotic vacuum that on it's own, glides across your floors to pick up dirt + grime. And when it's finished? It automatically plugs into the station to recharge!! Guys, clearly I'm a busy gal. 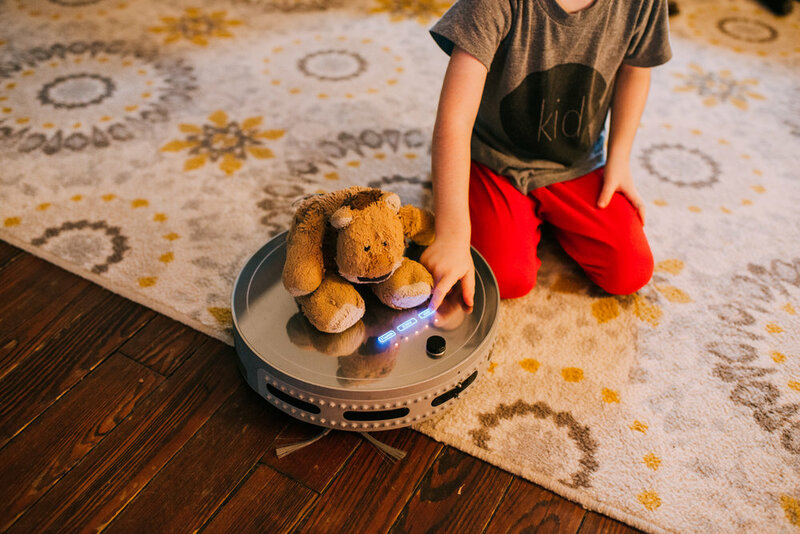 Vacuuming was my way of life before I had the kids and three cats and two dogs that I so belovedly have; but now I need one even more. And my trusty upright vacuum still does the job when I need it to, but there's just one problem 99% of the time....I have to PLUG IT IN AND PHYSICALLY DO IT. You either a.) think I'm a pathetic excuse of a human being or b.) you're kind of jealous--either is absolutely okay, but I promise you want to meet my bObi. She, yes, it's a girl; has incredible suction power and a trio of brushes that leave an incredible shine. She also has an attachable mop that finish floors with a fine polish. We try to mop every other week (is that bad?!) and USUALLY, the floor is pretty darn dark from all the many reasons dirt is tracked on to our floors. But since we've gotten the bObi? I kid you not, the water is basically CLEAN when we pull the mop out and dump it. My husband was so shocked recently, he called me down the stairs to come look. It's a BIG deal, Y'all. This robot is no joke. On top of it being an amazing invention for us, our four-year old especially adores it. "Can I turn on the robot vacuum??" he'll ask excitedly. And sometimes he likes to have his favorite stuffed animal Lion take rides on her. -It so easily gets ride of pet hair, dander, and debris all over my home. -It covers a WIDE range, easily goes under things like our entertainment center and side tables, and around the baseboards. -It goes on its' own to the charging station to refuel the battery. If I don't have you convinced yet, go online and look up some videos. AND go visit their website! I am FOREVER grateful to bObi for gifting me our bObi Pet, and honest to goodness, I think it will help your life get easier too. Fun fact: our crazy (and cute) orange wonder is also obsessed with bObi. He follows her everywhere, so extra bonus? She wears out our now eight month old kitten! Woot woot!